Hello everyone! Here's the story about our practice printable worksheets. I'm Mary Fifer. I'm the happy wife of one wonderful husband, the mother of our eight busy children, and the author of this website. We are glad to live in Kansas in the Mid-Western United States, a most beautiful part of the world, especially for its sunsets. I'be been through a college education with a BSBA in both Philosophy and Management, and have held several management positions including positions at two colleges. I also earned my private pilot license and logged 80 hours. Oh! The joy of flying! I left all this to be a full time mother. Oh! The joy of children and home life! My Husband Has Helped Hugely! Of course we're in this together. My husband had taught aviation in a private academy and moved up to being Chief Flight Instructor at one of the world's largest privately owned flight schools of that time. He was then promoted to be an FAA Designated Flight Examiner. I love to share that he uses our worksheets to help teach our children and has been a real mover for creating new pages for this site. My husband and I have both been teachers and we've been parents for many years. We know that both children in the classroom and also those studying at home need quick ways to cover the basics whether they're practicing or catching up. We also have many emails of folks exclaiming how helpful these worksheets have been for their children and students and think that you'll find the same. Well, when our own children were practicing their Math facts and Spelling words, we thought of creating worksheets that had the right answers to be copied. We had to rescue the ones who would copy the wrong equations or spellings. It's so much better when children have the right answers to copy the first time and then for practice - usually three times each on this website. It is rare to see worksheets that offer this kind of real practice, yet it is precisely what many children need. These worksheets offer practice like what my own third grade teacher had required years ago in her Math class; yet these worksheets make practice better because the correct version is on the worksheet rather than the child having opportunities to copy a mistake from the board, a flash card, or their own imagination. Sound familiar? Finding good practice for our own children had been a bit of a trick. So many times, text books did not teach the basic concepts well or the children simply needed more practice. Math facts were "taught" in scrambled order or a chart was simply handed to the children, "Here memorize this". Many books do not use a good learning order or they simply do not offer much practice of the basic facts. No more! These printable worksheets are your answer to the practice deficit at school and at home. And they're all free. Why? Because we think that millions of children around the world would love to have these and many families cannot afford to buy them. 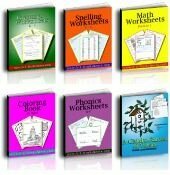 We do sell them in bundles so you can work offline, yet the site is organized by subject and topic so that the worksheets are easy to find online. Enjoy! Are you in the same boat we were in? Do your children need a way to just learn the facts? To make a long story short, we have created this website with thousands of professional worksheets. You can now search our site for practice printable worksheets or buy our worksheet bundles directly. We ourselves had needed practice worksheets and we'd seen plainly how it was hard for the children to find the extra time to practice their facts, especially after they'd spent six to eight hours a day on school work. When the children had been in school all day, homework itself was enough work for the evening. There was no adding any extra burden because all of us were spent. Oh! And then there were the times that they would copy the equations or spelling words wrong. Again?! Now we have worksheets that have the equations and the words handy to copy. Not only have our own family and friends used them, hundreds of thousands of visitors have done the same. Now it's true that our grandchildren may be the ones who benefit most since our youngest is getting older every day; but perhaps you get the idea. We care about these printable worksheets because we care about those who use them. Dearly. Teachers now have an easy way to assign the practice necessary to learn the basics. Parents now have the tools to back up what the books are teaching, or to supplement where the text books skip. Students now have an easy way to practice that adds little time or effort to homework time. On top of being excellent at covering the basics, our worksheets also require low teacher/parent involvement. Teach the material your way. Then, once your children are familiar with the equations, spellings, meanings, and diagrams, the main thing you have to say is, "Say this as you write it." There aren't many other directions that you need to give. Practice first and let the children finish on their own, then simply check that they copied the work well. We're glad to be able to produce these practice worksheets; and, newly, we made them interactive. Our newest pages have worksheets that your students or children can copy to their own computer files. Children can then practice typing while using the keyboard instead of printing the worksheets and filling them in by hand. These same worksheets can also be printed, either way works. You can also type your own notes on their papers - save the files for next time. You can save both paper and ink. You can store students' work in electronic files. Well, they're printable worksheets that your students can also use on the computer instead of paper (the same files can be printed). Yea! The biggest bug-a-boo with worksheets is the cost and hassle of printing them. The paper and ink expenses are not anywhere near the price of some workbooks plus shipping and handling, so these remain a thrifty reusable resource. It is very handy to simply create a copied file for each student in which they can fill out the worksheets and file them rather than printing them. It's also handy to be able to print extras for extra practice. Here's the long explanation about our printable interactive worksheets. Our bundles are now all interactive. Order them in bundles here. We use what we make and we improve what we make. Let us know what you think on our Contact form. Enjoy our site and thank you for visiting our practice printable worksheets! 2014 Update: We changed our site's name (and it's domain) from A-Z-Worksheets.com to PrintNPractice.com. 2017 Update: We've been growing and growing and I want to share with you the reason why. See my Site Build It review here. 2018 Update: Lots of technical work this year! We switched to the secure https last fall and have made our site GDPR compliant. Huge benefits for you! Simple for us since PrintNPractice is built using Sitesell's Block Builder. Check it out if you're wanting to build a website.